The administration isn’t going after Dreamers — unlike their parents — just yet. Today is the fifth anniversary of Barack Obama’s most important executive action on immigration: the Deferred Action for Childhood Arrivals initiative, better known as DACA. It gave so-called Dreamers — young immigrants who had been brought into the country illegally as children but who had kept their noses clean thereafter — temporary (but renewable) protection against deportation, and a shot at work permits. Upward of 800,000 Dreamers were offered this benefit. Many Dreamers and immigration advocates feared the Trump administration might seize this occasion to rescind DACA. Last night the Department of Homeland Security did announce it was rescinding DAPA (Deferred Action for Parents of Americans and Lawful Permanent Residents), a 2014 Obama initiative giving the same kind of temporary protection from deportation to the parents of Dreamers. That was no surprise, since DAPA had never been implemented. A Texas judge halted it, and the U.S. Supreme Court, in a 4-4 decision, decided not to review his action. It seems unlikely that a SCOTUS with Neil Gorsuch onboard would change its mind and uphold DAPA. But what did surprise observers is that the same announcement (supplemented by a DHS fact sheet) indicated DACA will remain in place. Donald Trump attacked DACA often on the campaign trail, and promised to terminate it immediately. So pro-immigration activists expressed considerable happiness. Not only was the continuation of DACA great news for them, it also indicates some flexibility from the Trump administration on the issue (immigration policy) on which he had arguably been most consistent, and consistently horrible from their point of view. But as relief spread in the advocacy community, the White House and DHS quickly “clarified” that no long-term decision had been made on DACA, and that the “assurance” was simply meant to make it clear the DAPA action did not apply to DACA. So pro-immigration advocates dialed back their happiness accordingly. So at this point it is unclear whether the administration is flip-flopping on a Trump campaign pledge to end DACA (and other efforts to protect “lawbreakers” from the consequences of their, or rather their parents’, actions), or that this was simply a head fake, or maybe even a meaningless nonaction that will be followed by the promised crackdown on Dreamers. One complication is that Republicans generally don’t think the president — any president — should be making such decisions by policy or executive order. So even if the White House has decided to leave Dreamers alone, it probably won’t announce it, since technically that’s a decision for Congress if it ever gets around to passing some sort of broad immigration legislation. It is true that if there is any soft spot in a GOP that has turned nastily anti-immigrant in recent years, it’s Dreamers. For every Steve King who thinks there are more drug mules (with “calves like cantaloupes”) than star students in the ranks of Dreamers, there are many others who think otherwise. 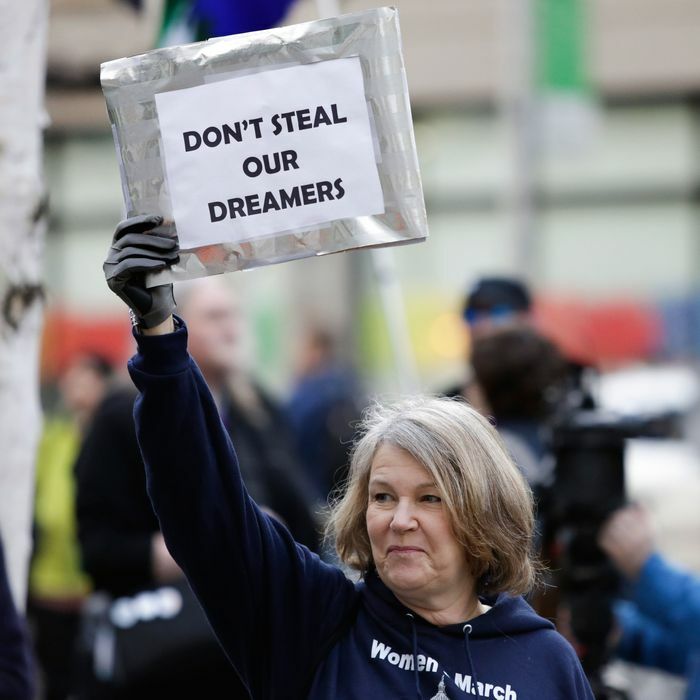 It has all but been forgotten now, but DACA began as a 2012 initiative that may well have been a clever Obama campaign stratagem to preempt a rumored Mitt Romney plan to embrace a similar legislative proposal from Marco Rubio. Having painted himself in a corner with savage anti-immigrant positioning during the 2012 primaries, Romney was frantic for a pro-immigration cause to embrace, and helping Dreamers seemed the least flip-floppy approach available. So if Trump does back away from deporting Dreamers, a lot of otherwise anti-immigrant Republicans could approve. For all we know, the DAPA/DACA maneuver today could even be a trial balloon to see how the Trump “base” reacts to something other than a ferocious commitment to the deportation of every undocumented immigrant in the country. He may need these people to stand with him if he winds up in more legal trouble than the Dreamers themselves.